It isn’t easy to decorate your home or give it a makeover when you are tired of looking at your boring old decor. You may feel uninspired to do something about it but after looking at these great ideas below, you definitely want to start transforming your home. As Malaysia enjoys summer almost the whole year round, tropical prints are great to celebrate our weather and make your home look more cheery too. 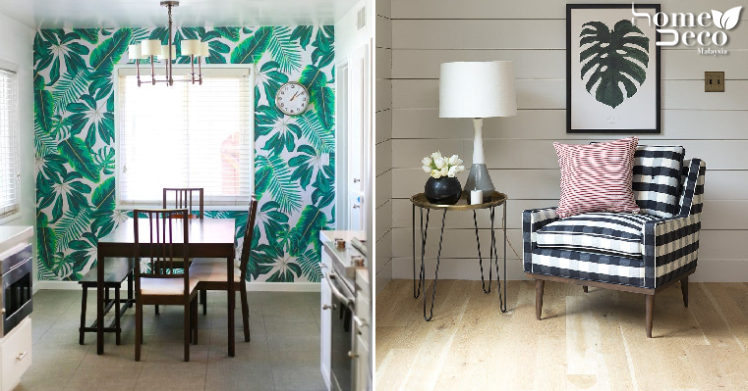 It doesn’t have to be a big piece, even a feature wall or some throw pillows with tropical prints can transform the space. Nothing changes up the room quite like going for dramatic tones inside just like this black room that looks edgy yet elegant. If you have a room that is spacious enough then you should go for it as it will look grand and luxurious. If your bathroom is looking a little tired then you can consider jazzing it up by placing a nice bathtub inside so that you can luxuriate in it for some alone time. You can choose the size depending on how much space your bathroom has as well. Plaid is a classic and timeless pattern that is so versatile, it can be used anywhere. Since it is rather bold and outstanding, you might want to tone down the rest of the decor so that the plaid can shine. This is another oldie but still a goodie as it never goes out of style. It may look deceptively simple to you but once you use it in your home, it really makes an impact but won’t overpower other fixtures and fittings. For a more contemporary feel, you should be minimalist and use crisp, clean lines in your decor. The modern style is easy to emulate, just make sure to keep things simple with sharp lines for maximum impact.